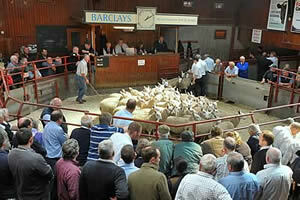 The Cumberland & Dumfriesshire Farmers Mart had forward 1,298 Store Lambs at their Weekly Sale at Longtown on Thursday 29th December, 2011. Stores still dear and easy to sell to a top of £84 and £79 for Beltex from Compstone End. Greyface £82.50 Crosshouse, £75 Pitland Hills; Texel £81 Cross House, £77 Howard House; Suffolk £70.50 Whitehouse. Blackface £70, £69 Pitland Hills; Cheviot £66.50 Hilltop; Easycare £66, £65.50 Glenapp Estates.